The persian cat is presented with this weird mass at its medial canthus, one on the eyelid and a couple on its chin. What are they are what needs to be done with them? 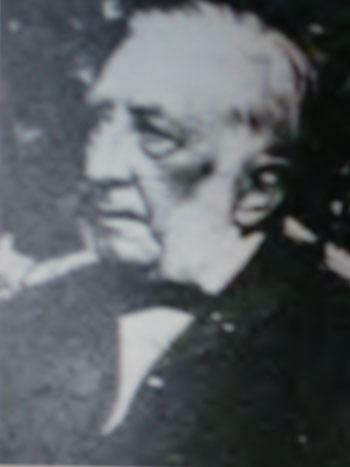 These are hidrocystomas, or if you want to be more eponymous, cysts of Moll (here he is – an anatomist from Utrecht in the 1800’s! A poor picture but at least it shows he wore a bowtie!!) They are cysts derived from apocrine sebaceous glands to be morte precise and need to be removed with sharp knife surgery, which we did with difficulty. When I have the histopath back I’ll pop it onto the website here! There is a recent paper on these – Cantaloube et al 2004 Multiple eyelid apocrine hidrocystomas in two Persian cats. 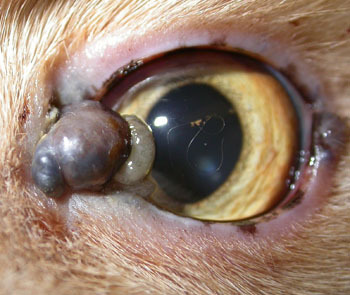 Veterinary Ophthalmology 7(2):121-5 but their cysts didn’t look quite as spectacular as this one to my mind! This entry was posted in Cases and tagged cat, hidrocystoma. Bookmark the permalink.